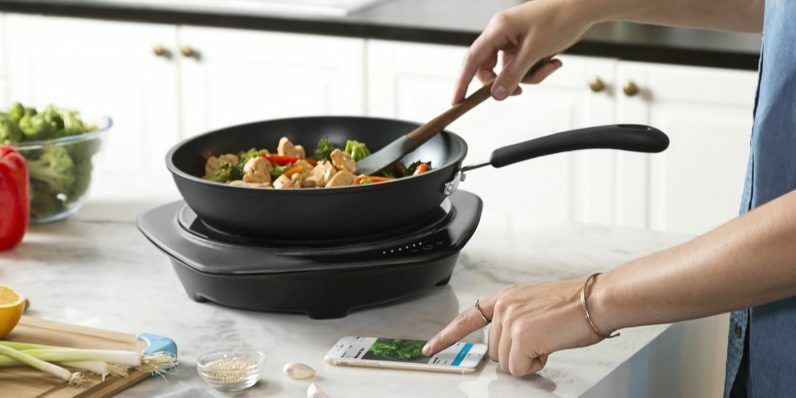 In honor of Tasty’s two-year anniversary, BuzzFeed announced its newest cooking venture — the Tasty One Top, a smart hot plate that syncs with the just-released Tasty app. The One Top, when used in conjunction with the app, will “automatically adjust temperature and power settings to precisely match the recipe instructions.” You can fine-tune some of the specifics, such as the temperature of a steak. The FAQ points out it’ll also work manually. It’s currently available for pre-order at a cool $149, and will come out in November. The app is currently only available for iOS, though Android’s apparently coming soon. You can also pay extra for a set of pots and pans, though any induction-compatible cookware will work. BuzzFeed claims the One Top can “Sous vide, deep fry, pan fry, stir fry, grill, fondu, shabu shabu, simmer, saute, slow cook, sear, poach, toast,” and presumably read your mail and bring you your slippers. What caught my eyes is one feature: “Pentagon shape — because Instagram.” Gonna need a little more information than that, BuzzFeed. Is a pentagon some kind of trending shape on Instagram I’m not aware of? I’ll take a pass on this, personally. I’m not the best chef to begin with — give me a crutch in the kitchen and I will hobble the rest of my days. Still, I can almost guarantee it’s going to sell out. BuzzFeed’s cooking pages are unfathomably popular. The main Tasty page alone has 87,500,000 likes at the time of writing. According to Tubular Labs, two Tasty videos were in the top 10 most-viewed social videos of 2016. Something about sped-up cooking set to elevator music attracts hundreds of millions of views. People like this stuff, and I can see the One Pot making its way into a lot of kitchens. That being said, if you use this without visiting the Tasty Facebook pages, you’ll miss one of their main pleasures: Watching people argue in the comments section about how they can make the same food, but better.